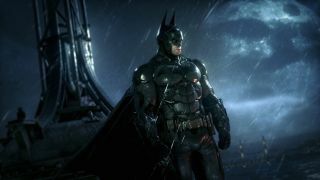 Nvidia has lifted the curtain on what you'll need to run the upcoming PC version of Batman: Arkham Knight - and like the angsty caped crusader himself the requirements are fairly demanding. A scan of the recommended system requirements reveals that you'll need at least an Intel Core i7-3370 CPU/AMD FX-8350, 8GB of RAM and at least an Nvidia GeForce GTX 760 to play the game as its maker intended. To see the rain rise off the Batmobile's bonnet in a cloud of fine mist (on Ultra settings, obviously), you'll need to up your graphics game to an Nvidia GeForce GTX 980 or AMD equivalent. While the game's minimum requirements demand 10GB less storage space, you'll still need a Nvidia GTX 660 or above for it to run. Batman: Arkham Knight is set to launch on June 23.